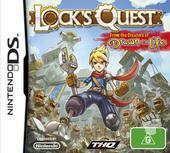 In Lock's Quest Drawn to Life, gamers are transformed into Lock, a young hero who is part architect and part engineer. Your mission is to build new structures around the sacred Source of the Artifacts in order to prevent the nefarious creatures known as the Clockworks from destroying these ancient relics. Although the story may sound a little clichéd at the best of times, the developers have ensured enough twists and plotlines to truly immerse you into this original gaming universe. At the end of the day, it's classic Nintendo DS! 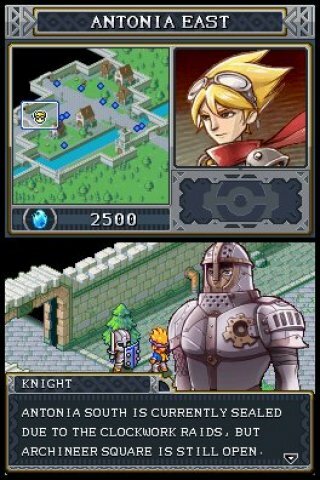 Gameplay wise, Lock's Quest Drawn to Life features elements of RPG and RTS as you engage in a 100 day race against the clock as you start from inexperienced boy and eventually become the experienced hero that you were destined to become. As you progress, you are awarded new skills and powers, however the enemies are also given some power-ups that will make the challenges rather interesting. 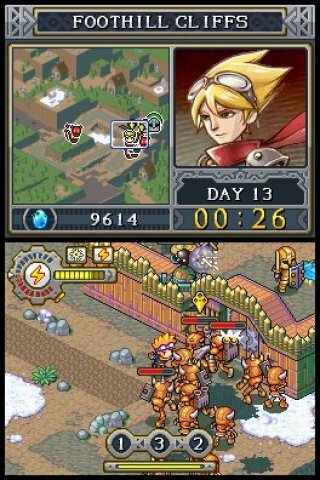 The game contains two modes that include "Build" and "Battle". During the build mode, you have a limited amount of time and resources to construct your defenses such as walls, turrets and the like. Once you have fortified your area, you go into the battle mode where you must repair your fortifications as Lock and also battle the enemy as Lock. This is done via some interesting mini-games. The title will take average gamers around 20 to 25 hours to successfully complete as you defend, attack and battle. 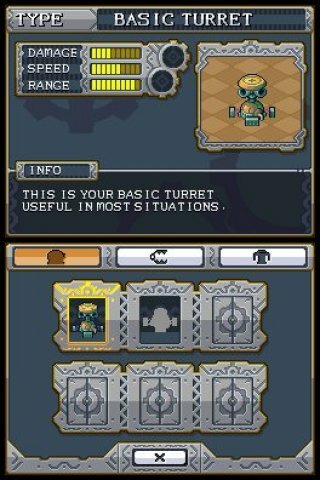 In comparison to other games on the market, the title does feature elements of Rampart as you must build and fortify your defenses, however it features enough originality to be quite unique. The game is quite fun as you build cannons, turrets and traps that in conjunction with your helpers and Lock himself makes for a satisfying RTS experience. As you progress, some of the missions become heavily populated with objectives and characters and it’s almost like a free for all and more impressively, the game runs silky smooth. Think Lord of the Rings! Graphically, the title contains quite a “cartoon” atmosphere to the gameplay that contains some great in-game graphics, good animation and some impressive attention to detail. Even though the graphics use pixels, it’s probably one of the best looking games on the market for this style of game. Musically, the soundtrack of Lock’s Quest is brilliant and sounds like a Japanese RPG title with its melodramatic tracks that changes with the gameplay. In conclusion, Lock’s Quest Drawn to Life is a thoroughly entertaining game that features a strong storyline, great gameplay and a variety of engaging cut scenes to keep you “drawn” to the title. It may be a good old fashion “Rampart” style of game, however it contains enough twists and turns to add something to the genre. Definitely one to play!